- German attacks on the eastern face of the Ypres salient continues today, and under heavy pressure the British centre is forced backwards. Several battalions suffer grievous losses, with 1st Suffolks reduced to a mere seven men. Though the Germans do not break through, they do manage to secure Frezenberg ridge. The Ypres salient after the German gains near Frezenberg, May 9th, 1915. - The weather having cleared, the postponed offensive by the French 10th Army is launched today. At 6am French artillery targets the enemy's wire and the first two trench lines, and at several points stop briefly to lure the Germans out, expecting an attack, only to resume the bombardment. The artillery also benefits from the first use of aerial wireless, whereby observers in aircraft above are able to radio artillery batteries regarding the targeting and effectiveness of their salvos. At 10am the French infantry go over the top. 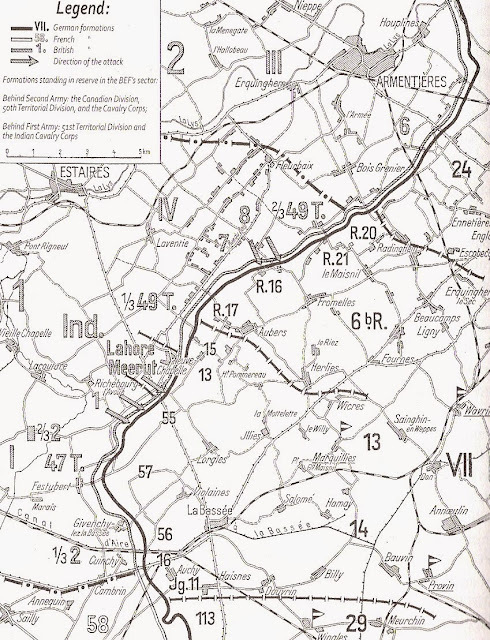 On the northern wing of the attack, XXXIII Corps is able to advance only a few hundred metres on the eastern spur of Notre-Dame de Lorette, while on the southern wing XVII and X Corps encounter intact German defences and make no progress. In the centre of the line, however, it is a much different story. Here XXXIII Corps, commanded by General Pétain, undertakes the main attack, aiming towards Vimy Ridge. 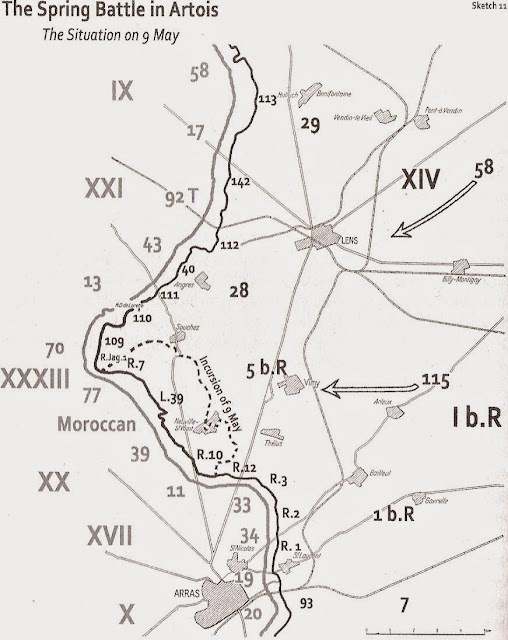 On his left Pétain uses 70th Division to secure the corps' flank while sending 77th Division in his centre and the Moroccan Division on his right to drive eastward into the defensive position of the German 5th Bavarian Division. It is here that the French offensive finds success; the Bavarians are pushed back out of their trenches, and within an hour elements of 77th and the Moroccan Divisions have advanced four miles and reached the summit of Vimy Ridge. It is an astonishing achievement, and for a moment the prospect of decisive victory appears possible. As in prior battles, however, the prospect is fleeting. Having occupied the heights of Vimy Ridge, it was necessary to hold it. The French and Moroccan infantry that had accomplished this success were exhausted and had lost most of their officers, leaving them ill-prepared to defend their gains. Pétain immediately orders his reserves forward to hold Vimy Ridge, but when the order goes out the reserves are eight miles behind the front lines, positioned there to keep them out of range of German artillery. It takes hours for them to make their way to the front and then move across the shattered ground of the morning battlefield. Meanwhile, the Germans are able to move reserves much quicker to the front. 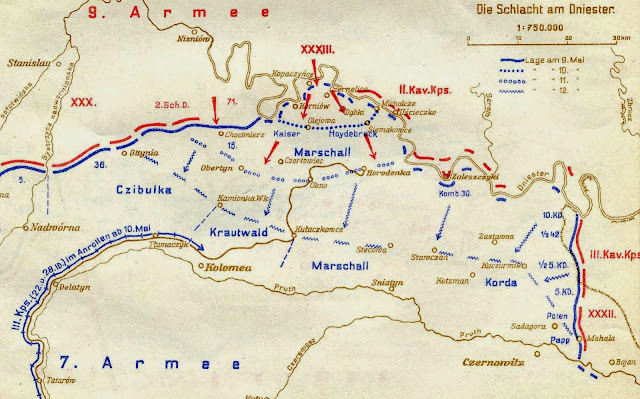 As soon as the attack had begun Crown Prince Rupprecht, commander of the German 6th Army tasked with holding the line between Lens and Arras, had requested and received two divisions from OHL as reinforcements, and 115th Division in particular was rushed to the front. By midday the first German reserves were arriving on the battlefield, and soon the French infantry on Vimy Ridge find themselves under heavy pressure. Supported by intense machine-gun and artillery fire, strong German counterattacks in the early afternoon drive the French off Vimy Ridge. Here the ability of the defence to move reserves to a threatened point faster than the attacker could move reserves to reinforce success once again proves decisive, and the initial French success is nullified. Nevertheless, Pétain's XXXIII Corps has managed to advance two kilometres, taken several thousand prisoners, and capture a number of German artillery pieces. This notable success, even if not the complete victory that appeared possible in the morning, still stands in contrast to the failure on either flank, and adds to the reputation of Pétain as an effective military commander. The accomplishment here, however, also convinces General d'Urbal of 10th Army that further attacks will make further progress, and so the operation will continue. The French attack in Artois showing the gains of XXXIII Corps, May 9th, 1915. - To the north of the French offensive the British launch their own attack. Undertaken by General Haig's 1st Army, it consists of attacks north and south of the ruined village of Neuve Chapelle, and aims to seize Aubers Ridge to the east, the original objective of the Battle of Neuve Chapelle in March. 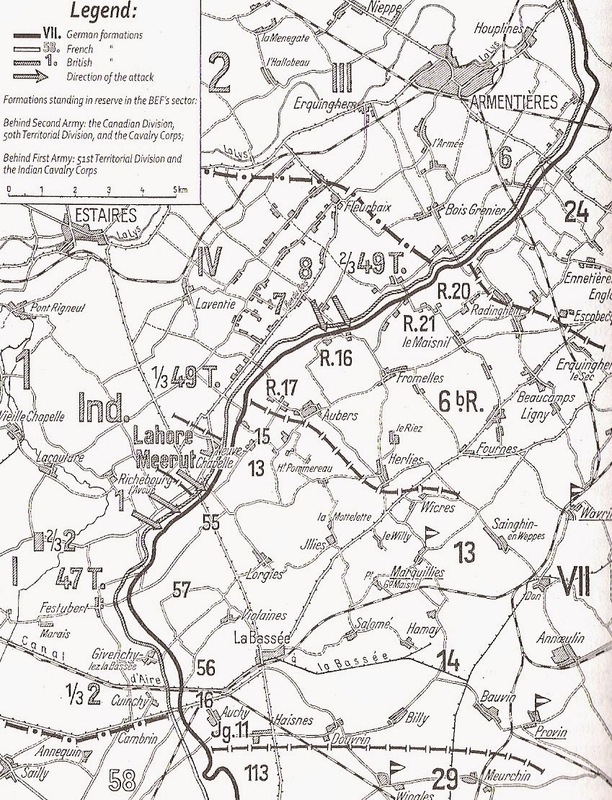 It is hoped that not only will the attack draw off German reserves, but that seizing the high ground at Aubers, when combined with the anticipated French capture of Vimy Ridge, will force the Germans to pull their entire line in Artois back. Haig attempts to duplicate the tactics of the March battle in the hope of achieving similar success: once again there will be a short artillery bombardment followed by a rapid infantry assault in an effort to surprise and overwhelm the Germans. However, the Germans had learned lessons from the March battle as well, and were not to be taken by surprise a second time. Further, the attack was along a broader stretch of the front than at Neuve Chapelle without an equal rise in the number of artillery pieces, which meant that each part of the German line being attacked received a lower amount of shells than the prior bombardment. The result was that when the British IV and Indian Corps attack this morning, it is a complete failure. The infantry find the German barbed wire intact, and as they attempt to navigate through it come under murderous machine-gun fire, and fall by the thousands. Only to the north of Neuve Chapelle, near Fromelles, do British infantry manage to reach the German trench line, and after vicious hand-to-hand fighting the German 6th Bavarian Reserve Division is able to throw the British back. 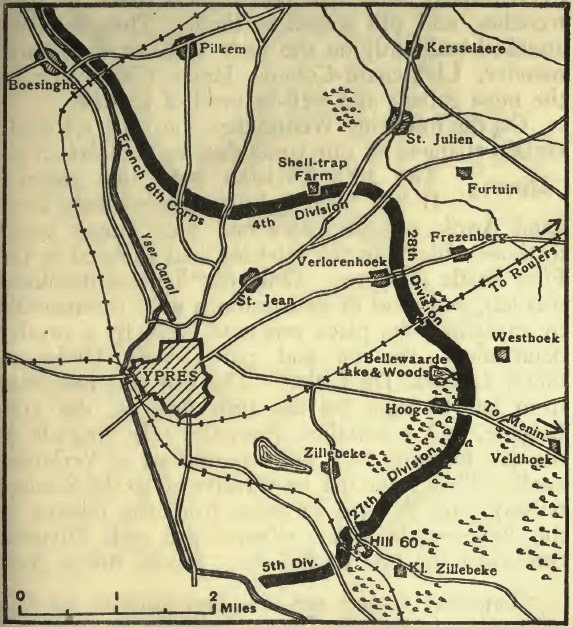 Nowhere does the British 1st Army achieve any lasting success; indeed, the greatest indictment of the British effort can be seen in the decision of the German 6th Army to begin moving reserves opposite the British south to face the French even as the Battle of Aubers Ridge is ongoing. As Sir John French, commander of the BEF, receives news from the front of the failure at Aubers Ridge, he inwardly seethes. He has long looked upon the Dardanelles operation as a dangerous diversion of manpower and munitions from the vital Western Front, the only place where a war-winning victory can be accomplished, and is particularly incensed at what he sees as an inadequate supply of artillery shells. As reports come in of British infantry being slaughtered on German barbed wire that was supposed to have been cut by the preliminary bombardment, French concludes that if the BEF had been given a greater allotment of shells the battle would have been a success. French also blames the government in general and Lord Kitchener in particular for a perceived lack of support for the BEF on the Western Front and the failure to supply it with a sufficient amount of munitions. At BEF headquarters today there is present Colonel Charles à Court Repington, the famed military correspondent of The Times and the press empire of Lord Northcliffe. Field Marshal French informs Repington in no uncertain terms just why the attack has failed and who is responsible. A fuse is lit. The Battle of Aubers Ridge, May 9th, 1915. - Another day in Galicia brings further German successes. On the northern wing of 11th Army the Wislok River is crossed by the German Guard Corps, which also seizes the heights just beyond. On their right VI Corps pushes east from Krosno for several miles, isolating the Russian garrison in Kombornia. After a brief fight the latter surrenders, and three thousand Russians march into captivity. The southern wing of 11th Army is equally successful: 11th Bavarian Division is also across the Wislok while 119th Division consolidates its control of the town of Besko. However, the advance of the former has drawn it to the northeast, pulling away from the latter to the south. It is also here where General Dimitriev has ordered the Russian XXI Corps to launch its delayed counterattack, on which he knows the fate of 3rd Army depends: if the German advance cannot be unhinged here, a dire situation will only worsen. - One of the reasons for the continued optimism at Russiam army headquarters (Stavka) despite the steady accumulation of disasters in west Galicia has been the planned offensive of the Russian 9th Army in east Galicia, which aims to cross the Dniester River, recapture Czernowitz, and occupy the Bukovina. In addition to the seizure of territory, it is hoped that the operation will force Austria-Hungary to shift reserves to the east and also encourage Romania to enter the war on the side of the Entente. The Russians have assembled 120 000 soldiers in the region for the attack, outnumbering the 80 000 men of the Austro-Hungarian 7th Army (formerly Army Group Pflanzer-Baltin) opposite. The latter also has to contend with ongoing supply problems, as everything has to be transported along a single narrow-gauge railway snaking its way through the Carpathians. At 4am today the Russian offensive begins when XXXIII Corps attacks across the Dniester at a bend in the river at Kopaczynce. The defenders are quickly overwhelmed, and the Russians are able to secure a bridgehead and hold off Austro-Hungarian counterattacks by 8th Cavalry Division and half of 42nd Honved Division. Further west, the Russian 71st Infantry and 2nd Rifle Division strike the Austro-Hungarian 15th Division, and make significant progress towards Obertyn. General Pflanzer-Baltin scraps together spare companies to send to the threatened points, and these reserves are able to retake some of the lost ground north of Obertyn this evening. Nevertheless, the Russians remain in control of the high ground north of Chocimierz as well as their bridgehead over the Dniester. The Battle of the Dniester, May 9th to 12th, 1915. - Given its diplomatic weakness, the Chinese government signals today its willingness to accept the revised version of the Twenty-One Demands submitted by the Japanese government on the 7th.